The Barn Door Kite - Some Background. I'm just guessing here, but the spar layout of the first Barn Door kite might have looked like the beams on somebody's hay shed door. 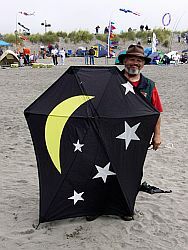 According to some authors, this kind of kite is the 'traditional kite of America.' Maybe this means it originated in the South of the United States where most of the crop farming has been done. To speculate a bit more, perhaps the first of these kites was just a Diamond kite with an extra vertical stick. Whatever the case may be, there is much in common between the 2 types of flat kites. From a distance, some Barn Doors could even be mistaken for Diamond kites, with the 3-sided top looking somewhat like an old arch-top design. The extra spar and more complex bridling in these kites make them more rigid than 2-stickers, which might help to explain why they have such a good wind range. With enough tail and a bit of bow in the cross spar as well, a Barn Door will put up with a lot of wind. It will still be up there when other simpler kites have been spun into the ground. The photo further down is a decent sized hexagonal Barn Door kite by Rod Beamguard. Rod had the photo taken at the Washington State International Kite Festival in 2004, and has kindly given permission for it to be displayed here. Overall size varies of course, although most Barn Doors are less than a meter (3 feet) tall. There are six basic variations of how the 3 spars are arranged. Construction can be with or without a line threaded around the tips of the sticks, forming the straight-sided outline of the kite. Most flat kites need a tail, and most flat Barn Doors suit having a single tail looped between the lower tips of both diagonal spars. Decoration of home-made kites takes many forms and shop-bought kites are also available in colorful designs. With the cross spar bowed enough, and a correctly adjusted bridle, this kite can be stable enough to fly without a tail. The bridle is traditionally attached to the kite in 2 places on each diagonal spar, although a 3-point arrangement is also very logical for this type of kite. Traditionally, the sail was paper but these days plastic or nylon is common. I don't know if any 2-line Barn Door designs are commercially available, but I've come across at least 1 kite enthusiast who has made this unusual kind of stunt kite. However, this page is strictly about single-line Barn Doors! Size. My 1-Skewer Barn Door kites are probably some of the smallest ones around, at less than 29 cm (11 inches) tall. A more common size is between 1 and 2 meters (4 - 7 feet) tall. Shape. The 2 diagonal spars can be arranged to meet at the top or bottom of the kite, or left parallel, or somewhere in between. This gives 5 basic pentagonal or hexagonal outlines. If all the spars cross in the same spot, it starts to look like a Chinese hexagonal kite. Hence there are 6 variations in all. My original pentagonal Barn Door had its skewers meeting at the bottom, with a single tail attached. Construction. Like the Diamond kite, using line around the spars to form the outline of the kite is optional, and probably not often used on smaller kites. I certainly didn't bother, with the MBK kite. Tails. 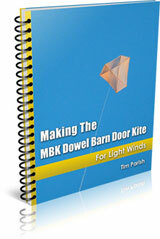 The range of different shapes of Barn Door kites means there are plenty of options for tails. Those with a point at the bottom obviously suit a single tail. All the other variations suit twin tails, with one attached to the bottom end of each vertical spar. Also, in this case, attaching a wide tail across the entire bottom edge is an option. I've seen some examples of this approach. In fact, the kite sail and tail can be the one piece of fabric, like a flat Dragon or Pennon kite. As with the Diamond, decorative tassels or tails can be attached to the ends of the cross spar as well. Decoration. Strips of different colored material can be joined together before the outline is cut. The appliqué technique involves sticking light but colorful cut-out patterns onto the sail material. Printed sail material can be used. Hand painting or airbrushing can be applied after the kite is constructed. There's a bunch of different ways to decorate a kite! The bigger the kite, the less difference the extra weight of decoration makes to its light wind performance. Some of the bigger Barn Doors around today are dressed up very impressively! Shop bought designs are available, but not in the same variety as the more common Diamond kite. Bowed. Some Barn Door kites are not terribly stable even with some tail, so the old trick of putting some bow in the cross spar is used. Like the tail-less Eddy Diamond kite, it is possible for some Barn Door designs to fly with no tail at all. Bridle. If you think for a moment about having 3 sticks crossed over each other, there are a whole lot of different ways to bridle one of these kites! 3 bridle lines is the minimum, and some larger kites use up to 5 lines to keep the kite steady in the air. Sail. 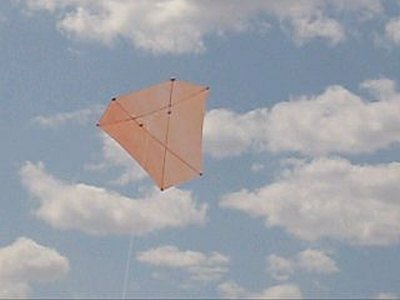 Maybe some of the earliest kites used paper, but rip-stop nylon would be the most common choice these days. To save money, plastic sheet from various kinds of bags can be used on small to medium sized kites as well. Since Barn Door kites can flat or bowed, and made with a range of quite different proportions, there is considerable variation in their stability in the air. Here's a thought of mine... Just compare a classic Diamond to a rigid Delta with no keel. The Diamond has most of its area towards the nose, while the Delta has most area toward the tail end. As many kite fliers would know, it's much easier to get the Diamond to fly properly! Similarly, the various kinds of Barn Door kites would have more or less of their sail area up front. Hence, they would tend to be more or less stable. Just like Diamond kites, Barn Door kites can be bowed to add more stability. That is, the cross spar, or spreader as some call it, can be bent back a little and held there with a string stretched from tip to tip. Even the most troublesome flat kite should fly well with enough bow and enough tail! Barn Door kite stories of my real-life flying experiences are worth checking out! Some Barn Doors, particularly large ones, are very efficient fliers. They can reach quite high line angles, like a modern Delta kite. Other people have fun stringing together large numbers of Barn Door kites in trains. This reminds me of the Taiwanese guys at the 2007 Adelaide kite festival. They had a couple of very long trains of 3-sticker kites up that day. One of the trains had the kites decorated to look like autumn leaves. The individual kites were constructed somewhat like Barn Doors, but probably originated from traditional Chinese hexagonal kites. The kites did not have tails. Surprisingly they didn't seem to be bowed either. Perhaps their construction was light enough to allow air pressure to supply the needed bow. I also read somewhere about a guy who owned a train of 111 Barn Door kites with prismatic appliqué decoration on them all. Shop-bought or home-made I'm not sure, but they would make quite a sight in the right weather! Barn Doors are sometimes used for KAP. That's Kite Aerial Photography in case you didn't know. I suppose a nice big bowed kite with plenty of tail could well do a good job in smooth air. There's at least one well-known kite maker who includes small Barn Door kites as one of her favorites for teaching kids to make and fly kites. She must have settled on just the right proportions for sail and tail to get a tolerant flat kite for kids to fly. Here's an interesting little snippet. Way back in the middle of last century, there was a Hi-Flier series of kites in the U.S. Some people have taken it upon themselves to re-create some of these kites, including a certain Jolly Boy Barn Door kite. Apparently it flies really well, despite requiring plenty of tail. A scientist called Alexander McAidie used flat Barn Door kites for lifting meteorological instruments. He had a few headaches with them apparently! By the mid 1890s this kind of work was being done by tailless Eddy kites. The diamond shaped Eddy kite had a bowed cross spar for extra stability. By the mid 1900s, making and flying Barn Door kites had become an American pastime. Popular materials were thin strips of hard wood for the spars and paper for the sail. A cotton framing line was fitted into slots in the spar tips, and the paper sail material folded over and glued. Below - see our 1.2 meter (4 feet) high Dowel Barn Door in flight. A great reliable flier!